I have a similar space for a bathroom, how wide is the room? Beautify your bathroomMixing styles doesn’t have to mean just country and contemporary. The owners of this bathroom, which has a Victorian-style, high-cistern loo, have introduced an art deco mood with black and white fan wallpaper. This simple panel doesn’t jar, as the rest of the room is plain white with black accessories, yet is enough to give the room an extra dimension. Know your taps1 Pillar tapsOften found in traditional-style bathrooms, pillar taps come in pairs and consist of one tap for cold water and another for hot. Operated by either a rotating handle or lever, pillar taps require two tap holes in the basin. Eye-catching patterns This bathroom’s design may seem basic, but notice how the bold wallpaper on even just one wall takes it from boring to exciting!Find more bathrooms with patterned wallpaper or multi-coloured walls. Get wallpaperingWallpaper had a big resurgence in the 1920s, with Parisian and German interior design houses being hugely influential. Vibrant and colourful designs were everywhere, featuring herringbone, shell motifs and even exotic depictions of jungle scenes. After the Great Depression of the 1930s, wallpapers became more subdued, with green, brown and charcoal hues prevailing, while patterns became smaller and more geometric. Although not many original wallpapers survived, there’s a huge number of reproduction designs influenced by the era. These busy patterns looks great on just one wall or above panelling. If you’re on a tight budget, just order a sample piece, or a length of fabric, and have it framed. 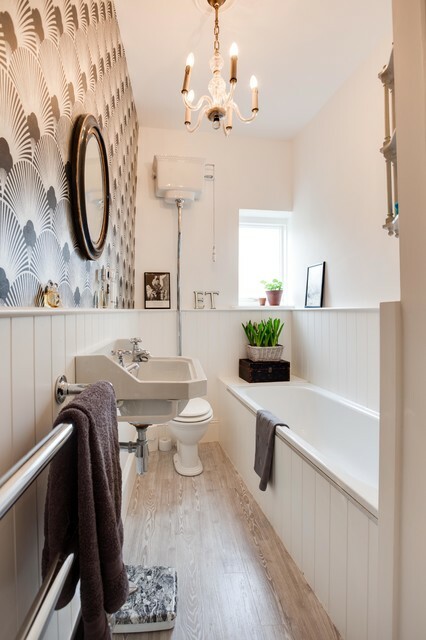 Say yes to panellingA vintage-style wallpaper teamed with tongue-and-groove panelling gives this compact bathroom a cosy feel. Also note the toilet with a high cistern – a classic heritage design. Swap slick modern spots for a more decorative chandelier, like this brass number, to keep things traditional.